This page is for information and results of the progress of the junior bowlers we have at our club. WE HAD COUNTY CHAMPIONS WITHIN OUR JUNIOR RANKS. JORJA JACKSON WITH SOPHIE PURELL WON THE EBA COUNTY UNDER 25 PAIRS. JORJA WENT TO LEAMINGTON FOR NATIONALS. LISA HAYNES SUBBED FOR SOPHIE WHO WAS AWAY. THEY GOT TO THE QUARTER FINALS - A GREAT SHOWING. KINDLY DONATED BY MARGHERITA PIPER. IN THE JUNIOR TRIPLES OUR FIRST TEAM GOT THROUGH TO THE PLAY OFFS AND LOST IN THE SEMIS BY ONE SHOT TO EVENTUAL WINNERS BUCKDEN. 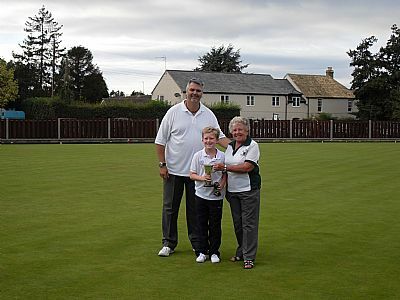 HELD AT NEEDINGWORTH BOWLS CLUB THE COMPETITION WAS OPEN TO U-18 PLAYERS FROM ALL CLUBS. WE FINISHED THIRD IN BOTH GROUPS MISISNG OUT ON TEH SEMI FINALS BY JUST 3 POINTS. BUT ALONG THE WAY THERE WERE BRILLIANT WINS AGAINST WARBOYS AND SAWTRY A. THE EVENTUAL WINNERS WERE ST NEOTS BEATING PAPWORTH 7-4 IN THE FINAL. Well done to Tom Best our Junior singles champion 2012. Both Tom & Dan had a great game on Sunday 16th Sept making a brilliant final. Tom just winning 21-17. It was a great advertisement for our junior bowling. They did all the juniors proud. Well done to both of you. WEDS 5TH SEPT AT 6PM AT SAWTRY. 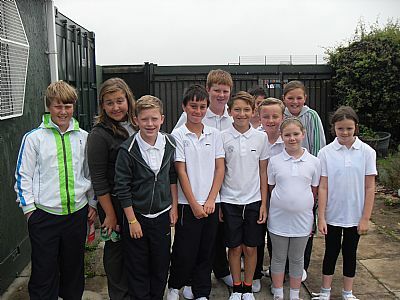 A TEAM OF TWO TRIPLES TRAVELLED AWAY TO SAWTRY TO PLAY THEIR JUNIORS OVER 10 ENDS. SO OVERALL IT WAS A DRAW. WELL DONE TO YOU ALL. BRANDON DID HAVE ROSS MARTIN AGAINST HIM!!!! SO WELL DONE. IN THE JUNIOR LEAGUE THE NEEDINGWORTH TEAMS FINISHED 3RD IN BOTH DIVISIONS NOT QUITE MAKING THE PLAY OFFS. THE SCHOOL SCHEME WAS WON BY JOE SHORT. WELL DONE TO SOPHIE, HARRY, JORJA, KEIRRAN, GEORGIA AND SAM. THE SCHOOL SCHEME WAS WON BY GREGOR STRONG.